UPDATE: David Goggins stopped his attempt after competing 3,202 pullups. According to tweets from the gym’s owner, the pullups tore up his palms and Goggins couldn’t continue. It’s unclear exactly how many Dawn Griner competed, but it appears she logged around 600. On Sunday, when you’re in the last legs of your Thanksgiving-induced stupor, Chief Special Operator (SEAL) David Goggins will try once again to set a new record for the number of pullups in an hour. At the CrossFit Brentwood Hills in Brentwood, Tenn., Goggins will try to crank out at least 4,021 pullups, one more than the record set by Great Britain’s Stephen Hyland in July 2011. 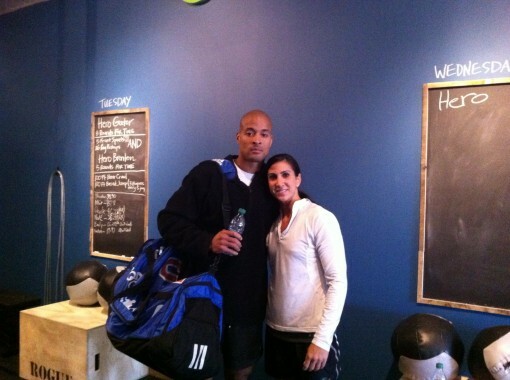 Chief Special Operator (SEAL) David Goggins and his girlfriend, Dawn Griner, will both try to set pullup records Nov. 25.// Photo courtesy of CrossFit Brentwood Hills. In September, Goggins appeared on NBC’s “Today” and tried to break the record and bring attention and funds to the Special Operations Warrior Foundation, a group that provides scholarships to the children of special operators who are killed. But a wrist injury stopped Goggins at 2,588 pullups. He told Nerve Rush that the portable pullup bar he brought to the TV studio wasn’t as stable as he would like, so his pullups had a bit of a swing. In turn, that swing required him to use muscles he didn’t use in training, and it caused the injury. Even so, he vowed to try again. Goggins will have some good company this time. His girlfriend, Dawn Griner, will be at his side as she tries to set a women’s record. It’s unclear how many pullups she must do, and record websites do not list a record holder for that accomplishment. Either way, the couple will set a new standard for unique dates.